Kuah is the capital city Langkawi. This is the first place upon arrival to the island by ferry. Since they gave Langkawi a duty free status, Kuah town changed a lot. It changed from a quiet, little town to a little city with beautiful shopping malls. There are four ferries a day to Tamalang Pier, about 10km south of Satun. Check in and have a nice day in Satun (Thailand). Then catch the next ferry back (the last leaving Tamalang at 1600 Thai time � an hour behind Malaysia). The geographical character of the area is high hills with a plain of fertile forest, streams and creeks in the east. 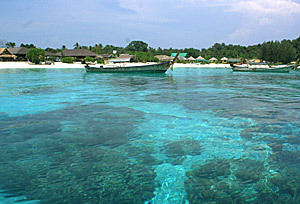 There are mountains and basins in the centre area and fertile forest of mangroves at the seaside. The province Satun is an ocean paradise. 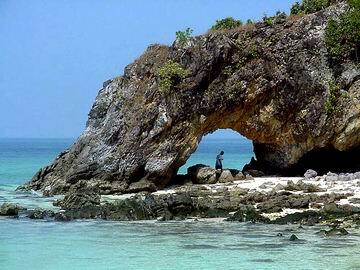 There are more than hundred islands in its Andaman sea, such as Koh Tong, Koh Tarutao, Koh Phetra, Koh Sarai, etc. Eighty percent of people in this province are Muslim. The town of Satun is a pleasant little city where crews based in Langkawi often come to get a taste of Thailand. It's predominantly Muslim, with not a lot to see, but its lack of tourists is part of its charm. It's a interesting place to spend a couple of days. People are genuinely friendly. Also there are at least two decent hardware stores in Satun where you can find bargains on stainless bits, though don't expect yacht chandlery. 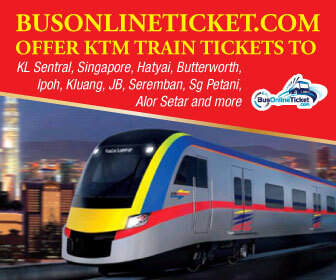 This is also the easiest route for travelling from Langkawi overland to Phuket, Hat Yai or Bangkok. 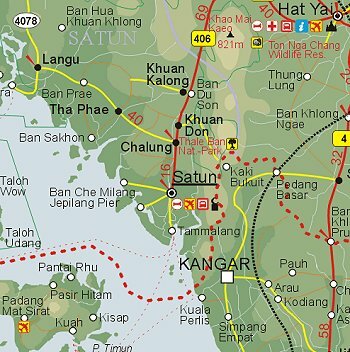 Satun is about 973 kilometres from Bangkok. The trip to Satun takes about : Approximately 1 hours 15 minutes. There are daily 4 trips between Langkawi and Satun. The first trip starts at 09.45 and ends at 16.30. From Satun the first boat departs at 09.45 and the last one at 17.00 hours. You can also make a day trip to Hat Yai. There is time differences between the two countries. Kindly check the departure time of the ferries carefully, as the above schedule shows arrival and departure times of Thailand. Please be aware, that you are crossing the border between Thailand and Malaysia. You have to pass the customs and make sure that your passport is stamped when leaving or entering Thailand.